Join Allison Pelot and Dr. Seth Watterson for a workshop series exploring the foundational biomechanics of a handstand. Our intention is to help you gain more confidence, shoulder stability, core strength and dynamic stability in your handstand. All levels are welcome! You don’t have to have any handstand experience to join this class. Just the desire and willingness to get started. We’ll provide you with all the tools to begin a safe and stable handstand practice. We’ll be covering tips to improve positioning in aims to building more integrated strength and efficiency. As well as covering program designs that will help you overcome common weaknesses that might be holding you back. We’ll explore wrist, shoulder and core mobility and strength and we’ll provide you with self assessment tools that will help you discover where you are in the process and where you need to focus. We'll then teach you how to kick up to and fall out of a handstand and develop the confidence and strength to hold a handstand for longer lengths of time with a wall. You'll gain more body awareness in your core, hips and shoulders. More confidence and safety around your handstand practice. A direction on where you can begin to focus so you can hold your handstand longer with more strength and without any pain. 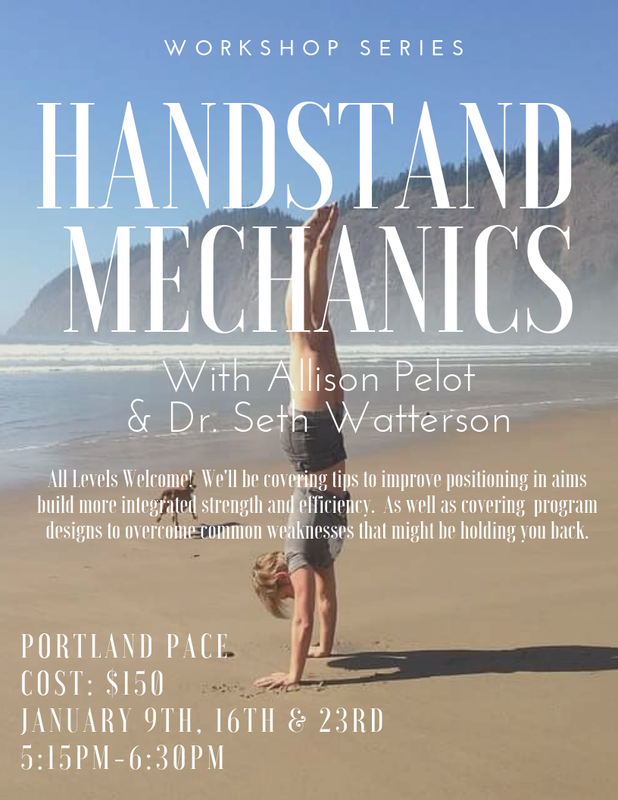 Join Allison Pelot and Dr. Seth Watterson for a workshop series exploring the foundational biomechanics of a handstand. Our intention is to helping you gain more confidence, shoulder stability and core strength and dynamic stability in your handstand. All levels welcome! You don’t have to have any handstand experience to join this class. Just the desire and willingness to get started. We’ll provide you will all the tools to begin a safe and stable handstand practice. We’ll explore wrist, shoulder and core mobility and strength. As well as we’ll provide you with self assessment tools that will help you discover where you are in the process and where you need to focus. Join Allison Pelot and Dr. Seth Watterson for a 4 week workshop exploring the foundational biomechanics of a handstand. Our intention is to helping you gain more confidence, shoulder stability and core strength and dynamic stability in your handstand. We’ll be covering tips to improve positioning in aims to build more integrated strength and efficiency. As well as covering program designs to overcome common weaknesses that might be holding you back. Class will meet every Wednesday from 5:15pm to 6:30pm for 4 weeks, October 24th - November 14th. Join Allison Pelot of Integrate Yourself Podcast and Pamela Sery of Delightful Yoga for a day of hiking in Oaks Bottom Wildlife Refuge, a morning yoga session (focusing on feet) and grounded nutrition talk about hormonal balance and how to listen to what your body is telling you. Do you skip meals because you're so busy? Do you find yourself needing to take a nap in the middle of the day or you feel so overwhelmed by the end of the day you just can't fit one more thing in? Do you find you're not recovering well from your workouts and even getting injured? Do you get sick often? Do you want to have more energy to live the life you love? This workshop is for every woman who wants to do it all and have the energy to do it. It's for business owners, mothers, mothers who work, women who help other people and who want success. Women who want to perform their best at everything they do. How do we take on the world, still have enough energy for ourselves and stay healthy? In this workshop you'll learn how to eat for energy that is sustainable, keeping you healthy and performing at a high level. There are two ways we can produce energy. One way is through the stress hormone response which creates faster aging and more break down of the body and a slow down of the metabolism. The other way is through nourishing the symbiotic relationship between your liver and your thyroid. This creates not only more energy but a slowing down of the aging process and an increase in your metabolic rate. In this workshop you'll learn about how the liver and thyroid work together to create lasting energy, raising body temperature and your metabolic rate. We'll talk about how to avoid pre-mature aging issues like fatigue, varicose veins, wrinkles, liver spots and hair loss. How by supporting the liver you can allow your body to naturally detox and repair more quickly. Finally we'll talk about real foods that support your liver and thyroid and help them function better. You'll learn how to set healthy energetic boundaries, get clear on what you want and release what you don't want. You'll walk away with an action plan and a deeper understanding of how you can make food work for your body and clarity around what you want and where you want to be. Learn how you can do this and more! WHAT KIND OF BODY ARE YOU CREATING? We'll explore our own belief systems and how they can either limit or expand our potential to get healthy and create the body we desire. You'll walk away with a new healthy mindset, clarity on what you want to create and a solid action plan including simple nutrition steps you can start right away. We'll explore the psychology of weight loss, look into our own self sabotaging beliefs and behaviors as well as learn about hormonal balancing with food and healthy habits. You'll release what's really holding you back by unlocking your true potential.